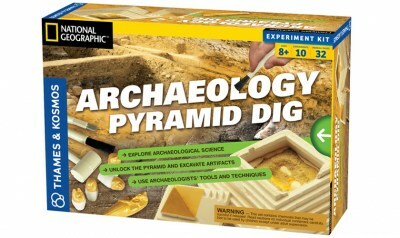 After using hieroglyphics to decipher the secret to unlocking the pyramid, use tools and techniques similar to those of a real archaeologist to carefully excavate a sarcophagus and four canopic urns from the hardened sandy catacomb inside. Practice the best techniques for excavating an archaeological site, such as digging, troweling, screening, brushing, and record keeping. As you uncover the artifacts in the pyramid, you will learn about important aspects of archaeological science, including surveys, excavation, conservation, dating, and remote sensing. 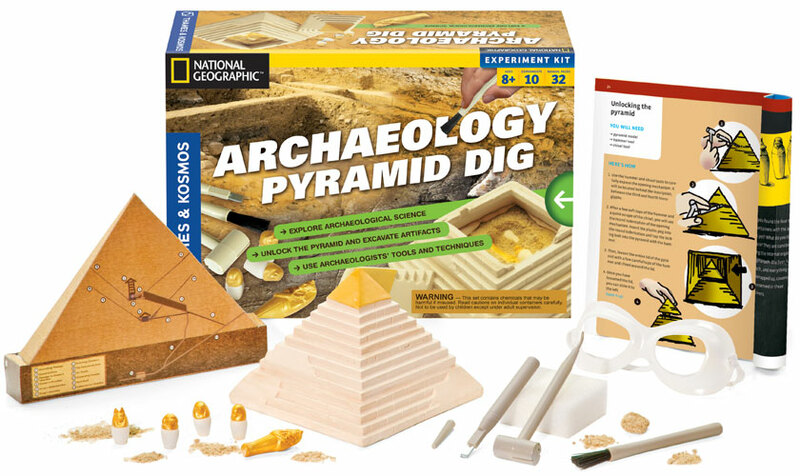 Learn how to create a gridded excavation site and a diorama. Investigate the layout of the pyramid, its various chambers, hidden passageways, and security devices by constructing a three-dimensional cross section of the pyramid. A full-color, 32-page manual gives step-by-step instructions for the activities and experiments. 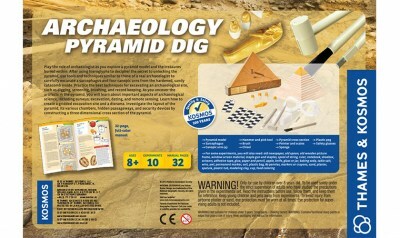 Play the role of archaeologist as you explore this pyramid model and the treasures buried within. After using hieroglyphics to decipher the secret to unlocking the pyramid, use tools and techniques similar to those of a real archaeologist to carefully excavate a sarcophagus and four canopic urns from the hardened sandy catacomb inside. Practice the best techniques for excavating an archaeological site, such as digging, troweling, screening, brushing, and record keeping. As you uncover the artifacts in the pyramid, you will learn about important aspects of archaeological science, including surveys, excavation, conservation, dating, and remote sensing. Learn how to create a gridded excavation site and a diorama. Investigate the layout of the pyramid, its various chambers, hidden passageways, and security devices by constructing a three-dimensional cross section of the pyramid. A full-color, 32-page manual gives step-by-step instructions for the activities and experiments.